My Name is Rory Saroso, I’m one of HANDs! Fellows 2014/2015 from Indonesia. 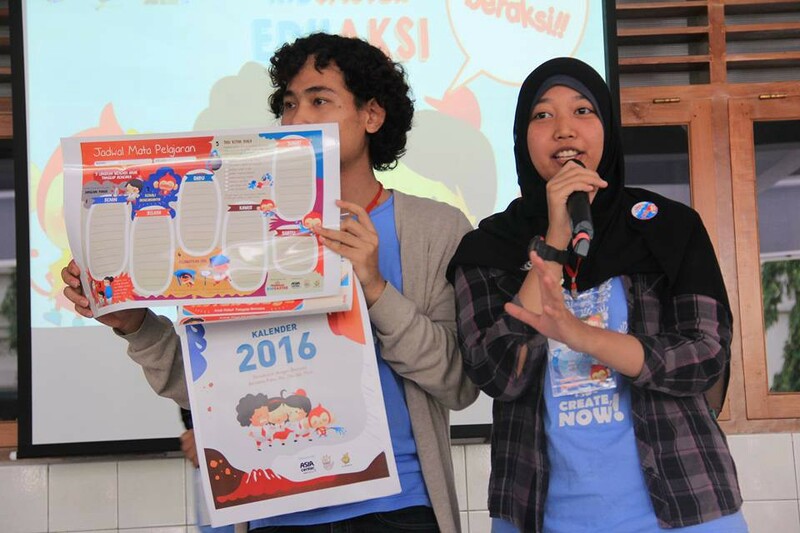 I’m a Social Worker for Yayasan (Foundation) Abdi Asih Surabaya. Our NPO’s main activity now is assisting people with HIV/AIDS to live better lives in terms of health, jobs, and so on. I love kids — their world is amazing to me — so I loved our study trips during the HANDs! Trip in 2014/2015. We met lots of kids, heard their stories, played with them and we also learned so many creative activities from the people we met on our study trip, as well as other HANDs! Fellows. The reason of school visiting is…. In my experience, there is not much awareness about disaster preparedness and mitigation in Indonesia. It was never taught in any schools. When I was a kid, I was never taught about disaster preparedness and mitigation, such as what we should do when there’s a volcanic eruption, earthquake, flood or fire. 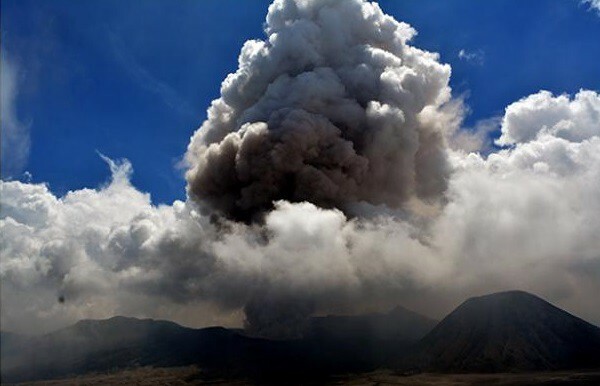 Surabaya is quite near Mount Bromo, Mount Kelud and some other active volcanos in East Java. In my opinion, during disasters, children are vulnerable victims. Because the adults lack information about responding to disasters, they get panicked and sometimes forget about their children. The adults leave their children in fear, and just focus on themselves while forgetting that their children are being hurt by the event. Without them realizing it, the fear in their kids grows and grows. I don’t want that to happen in the future. 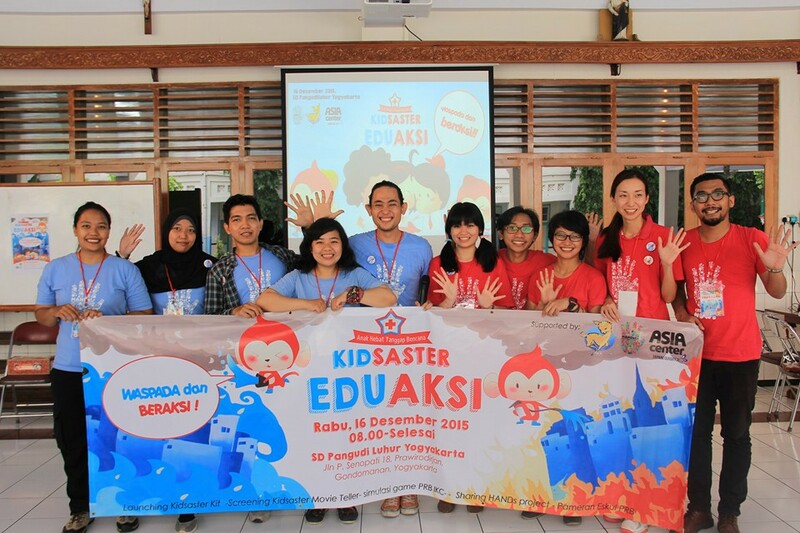 Our Action Plan is actually part of KIDSASTER EDUAKSI (Kids and Disaster, Education and Action) project. The purpose of this project is teaching kids about disaster preparedness and mitigation with simulations and an item that they familiar with. We make a calendar and a scheduler, which children are very familiar with. They need them, and they will read them on a daily basis. Based on that, we put information about DRR (disaster risk reduction) on that, we make those items as attractive as we can for the children. We also ask them to make their own emergency box and help them understand why they may need it someday. 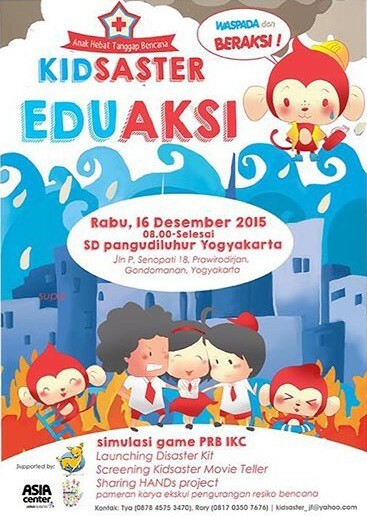 As part of KIDSASTER EDUAKSI, I share this information through the community, because it will help me spread this message faster than if shared just through school activities. I have been helped by my fellow university student who interested to work together on this activity, and we went to KIDS Capoeira, KIDS Jiu Jitsu, and the Home Schooling Community. 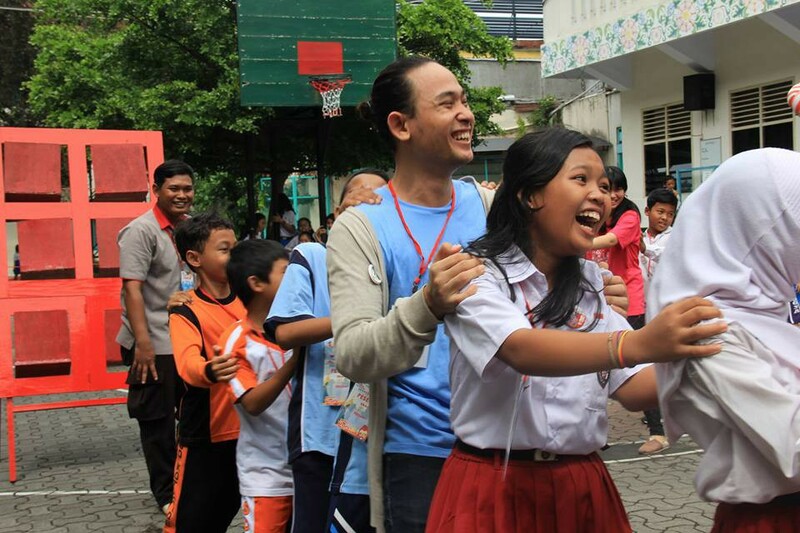 Since we don’t have any equipment to do disaster simulations like what we do in Jogjakarta, we help the kids to understand information with storytelling and playing together with them. 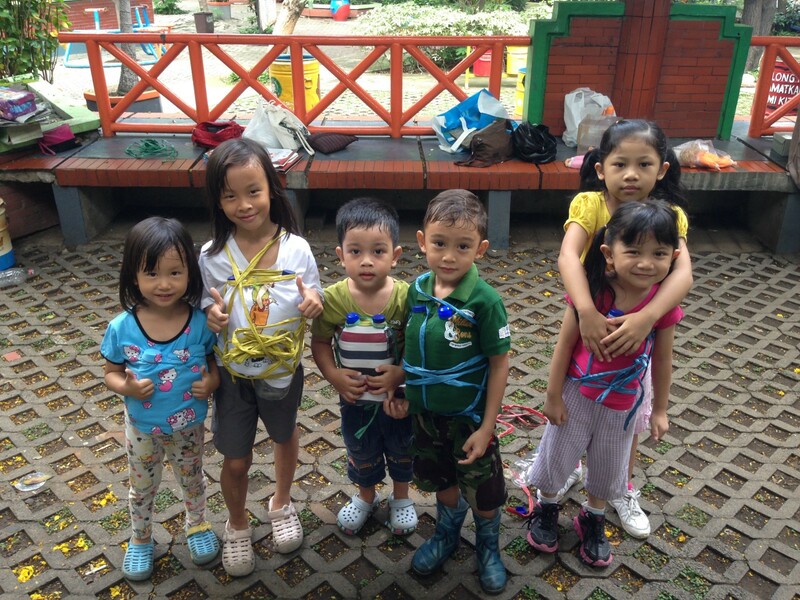 They all love it, we teach them how to make life vests for flooding with empty mineral water bottles, we make emergency boxes together, play earthquake simulation games together and when we do a presentation at a park, we go around the park together asking what they should do if this and that disaster happens. In this way, they will ask more and understand more. 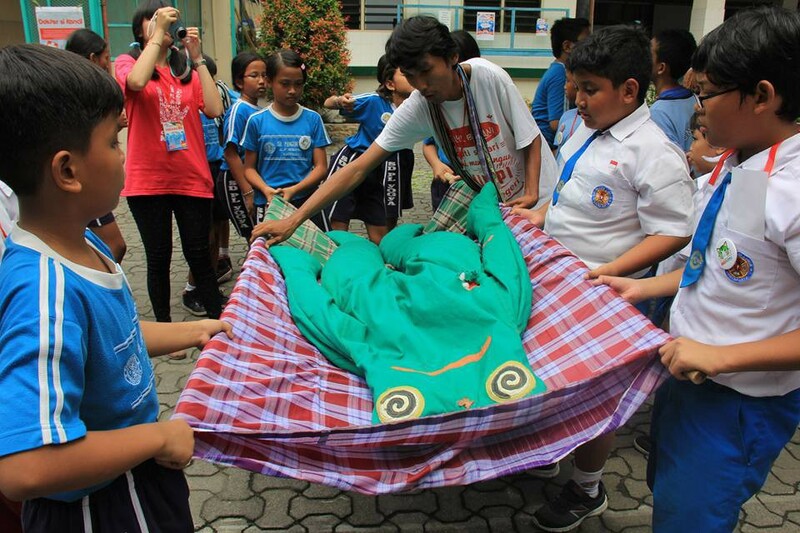 Practicing how to carry a big frog “Kaeru” using Indonesian traditional cloth, Sarung. 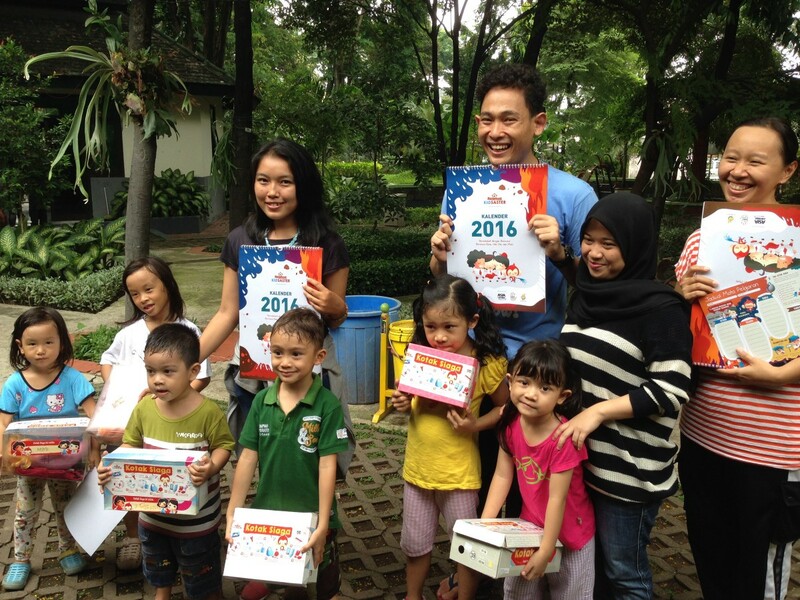 The children mostly love it and their parents also support this activity. The benefit of doing this through the community is the parents will participate and also help their kids. In this way, we do not only educate children, but also their parents. I really enjoy this activity. I feel close to the participants personally and we make bonds and develop mutual understanding between children, their parents, and ourselves. Because of that, some kindergartens and elementary schools are interested in this and want us to share these activities with their institutions so they can adapt this as their part of school curriculum. The East Java Office of the BNPB (Indonesian National Board for Disaster Management) gave us positive feedback about our product and activity and invited us to share it when going to disaster-prone areas in East Java to educate local people. Project Contents: Teaching children about disaster reduction with items Fellows made such as calendar, time table sheet.